Interlude: What Lies in the Deep? Lief Erikson was only a child when his renowned sire Erik the Red had disappeared at sea. Before him, legends tell of Gunnbjörn Ulf-Krakuson being bold enough to drive his ship into the icy waters west of their homeland. “For Erik,” he muttered under his breath. He was determined not to have he and his men suffer the fate of those who came before them. The sea was rough but his men were bold, courageous, warriors to the last. Loyal to the oar, to the sail, and to Lief. “Are you sure, lookout?” Lief cried out to the man roped halfway up the mast. There had been three false sightings before. Brave though they were, the Viking crew had been out of sight of land for many weeks. Provisions were sufficient, but there were legends of beasts so large and fierce that they could swallow a Nordic longboat whole. Before now, the last sighting of “land” was mere days ago. As it turned out, they be whales, not islands, their plumes shooting higher into the air than the mast of Lief’s boat, with even the smallest being three times the length of his vessel. “Yes. See just ahead on the horizon,” the lookout yelled down toward the deck. He was right. Their intent had been to sail due west but after two weeks, winds and currents forced them to the north as well. Now he could see the edge of a land, snow and ice but still land. A promontory was dead ahead, but to the north, the shore stretched out as far as the eye could see. Then not five boat lengths to the south a whale breached the water sailing skyward is if fleeing from some monstrous terror, and it wasn’t alone. The pod they’d seen days before, but now they were all surfacing at great speed and then diving again, turning this way and that as if trying to avoid some calamity. The son of Erik was not convinced of this, but he could say naught else. They were in sight of land and though large, the whales had never been known to menace the vessels of men. Leif was still looking at where the whales had submerged when the very sea boiled around his boat. They were strong and disciplined men and though terror of the unknown seized their hearts, their bodies served the boat and they obeyed without question. It had a maw that could engulf a score of ships, teeth longer than the mast, eyes cold and dead, like large, dull, black stones stared at him as it surfaced with a whale cow in its jaws, blood and water was spilling over the men and the deck. The force of its dive back into the depths nearly caused the boat to capsize and three men were thrown overboard and dragged under the waves, never to be seen again. Miraculously, the lookout on the mast survived, tied as he was in his perch. He thought of his Father. He thought of Gunnbjörn Ulf-Krakuson of a century before. Lief thought of the tales of all those boats who left sight of land and never returned. Some said it was due to storms. Others thought they lost their way and could never find home again. Some thought the sea was filled with large, terrible, demon-like creatures that devoured any ship daring to cross forbidden waters. They might make it. They were getting closer. Even if he had to scuttle the ship, at least they’d be alive on some foreign shore. Perhaps that was Erik the Red’s fate as well. He might yet see his sire again, should he have survived the years. Then the sea went wild as if some mighty force were pushing the water up directly beneath them. Men looked into the water and wept. The lookout on the mast held his grip tight as his face contorted in horror. The Leviathan’s jaws burst from the ocean port and starboard and then closed upon their helpless craft. Leif Erikson, his boat, his men, all disappeared in one terrifying instant down the throat of an impossible beast joining those brave and foolish souls who went before them as well as those who would come after. The monster casually closed its jaws and sank back into the Stygian depths. 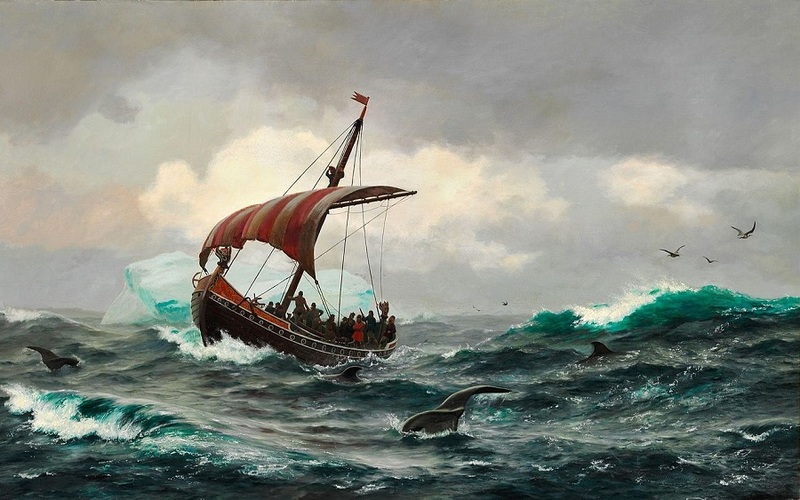 At the dawn of the 11th century CE, Leif Erikson was fated never to explore the coast of the land we now call Canada, and in this tale, he only managed to come within sight of Greenland. Neither Erik the Red or Gunnbjörn Ulf-Krakuson would visit Greenland as they did in our history. These brave men and any who later called themselves explorers found that the terrors they imagined were held by the sea were greatly compounded by an impenetrable barrier of teeth and flesh. In this world, the monsters of the land had long vanished, but those in the sea remained and endured. Men like Columbus, Cabot, and DeSoto would never “discover” the New World for it was unintentionally guarded against European explorers, colonists, and conquerors. No one from the east dared venture in boats out of sight of land for beyond that point, there be dragons. I originally meant for this to be a stand alone story although it does have a bearing on my “Key Out of Time” series. I decided to include it formally in the Table of Contents so readers of this series but not of my shorter fiction could gain the perspective it gives. This “interlude” immediately follows “Incursion” in my homage to the works of the late Andre Norton (Alice Mary Norton). The next chapter in this book is Restoration. Addendum: 7-12-2018: I’m also using this story for Tale Weaver/ Fairy Tale # 179 – Voyage of Discovery – 12/7/18 hosted by Mindlovemisery’s Menagerie. The idea is to use the concept of discovery and voyaging to craft a poem, short story, or some other creative work. I’d already created this story, initially as a standalone, but then inserted it into a continuing series. I think it fits today’s prompt as well. Well, if you’re going to populate the seas with monsters that eliminate open-water exploration and migration, shall we find them in the Pacific as well as the Atlantic? If so, much of the South Pacific would never be populated with humans, nor would the Hawaiian Islands, nor would such peoples have reached South America in reed boats as some evidence suggests they did. The only access point would be the seasonal Bering land-bridge from northeast Asia; and who knows how many more millennia it might have required for migration southward into the “American” subcontinents? And then there is the question of Australia and the actual source of its “aboriginal” population. I’ve considered whether or not to also populate the Pacific with such creatures as well. I suppose it’s problematic leaving them just in the Atlantic. After all, wouldn’t they migrate? On the other hand, what if something unique about the Atlantic keeps them there? I’ll have to think about it. In the world I’ve created here, they didn’t but then, Columbus and a score of other European explorers and colonists never did either. There is a ‘monster’ in the Pacific. Cadbrosaurus. I think that is the name…. :o) Great story, James! 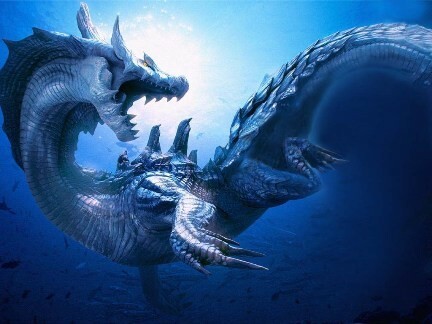 Haven’t heard of the Cadborosaurus in the Pacific Northwest before, but if I have a wall of sea monsters in both the Atlantic and Pacific, it screws up my time continuity plans (more on that later). Thanks for the “heads up”, Kris. This one certainly wasn’t, though in our world, it went extinct about 65 million years ago. No I didn’t, but obviously I read it before. “Wineland”. Yes, that’s the ticket. 😀 Of course in my tale, they didn’t make it. Oh, by the way. This wee story actually ends up being part of my larger time travel series I’m currently writing. It’s not apparent at the moment, but it will be in a few days. Enjoyed this tale James, those early explorers did it tough in the ships they sailed.Thanks for adding your thoughts to the tale weaver.